Submarine Monument , or abbreviated Monkasel , is a museum of submarine found in Embong Sousa , tile , Surabaya . 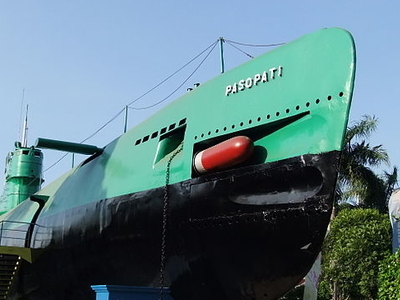 Located in the city center , this monument is actually a submarine Pertamina Pasopati 410 , one of the Indonesian Navy 's fleet made ​​the Soviet Union in 1952, this submarine was involved in the Battle of Aru Sea to liberate West Irian from the Dutch occupation . Submarine and then taken to the ground and made into a monument to commemorate the courage of warriors Indonesia . This monument is located on Jalan Pemuda , right next to the Plaza Surabaya . Also at this point there is also a movie screenings , which featured the wars in the Aru Sea . If you want to visit the sights of this , it will be accompanied by a local guide who is there. Here's the our members favorite photos of "Monuments in Surabaya". Upload your photo of Submarine Monument! Kenhaway is the only Touristlink member to visit Submarine Monument. Have you been here? Click here to save it.